As the Polish community of Black Rock continued to grow, civic, and cultural clubs began to form. In 1899, 11 men under the guidance of Reverend Adam Marcinkiewicz of Assumption Church established the Polish Cadets. Like the Polish Falcons of America, the early Cadets had a focus on athletics and military training. The membership in the organization swelled to over 70 men by the outbreak of the First World War. Around that time, the robust group of young men decided that they needed a clubhouse to call their own and purchased a lot near the corner of Grant and Amherst Streets. In short order, Wladyslaw Zawadzki was hired to design the building and on September 7, 1913, in front of a crowd of 10,000 people, Censor of the Polish National Alliance Anthony Schreiber laid the corner stone. 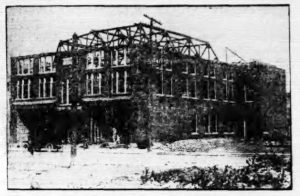 In their new home, the Cadets had a large assembly hall, meeting rooms, baths, a fully equipped modern gymnasium, and in time a library, kitchen, and bar. In short order, the Dom Kadetow Polskich building became the community center of Black Rock. With the Great War looming, the large hall would be used to host speakers, hold celebrations of the May 3rd Constitution and once the conflict started, fundraisers for Polish relief were held. Of its members, 18 went to Europe to fight, with all returning home. Following the war, the last of the mortgage was paid off and the building was owned free and clear. Many of Black Rock’s Polish organizations found a home at the clubhouse. Polish American Alliance Council 92, Polish Union of America Colony 2, the Lirnik Singing Society, and Glos Mlodziezy Polskiej Society would all use the Cadets building from time to time. In the 1920s, a 1,200 volume library was added to the facility and soon after, women were allowed to join the Cadets. Many Polish organizations based at Assumption and St. Florian’s Church also used the Cadets hall for banquets and festivals. 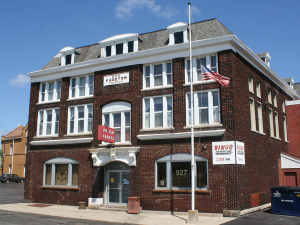 Besides being an active Polish center, the Polish Cadets hall was open to the entire community of Black Rock. Hungarian musicians, Erno Kiraly and Emmy Kosary would grace the stage, the Grant-Amherst Business Association would meet in the clubrooms and 927 Grant would be the home of Buffalo’s Czecho-Slovakian Day celebrations. After World War II the organization saw a growth in membership, reaching over 1,200 by the end of the 1950s. With this many active members the Cadets soon formed their own credit union and a singing society was started. More non-Polish Black Rock organizations began using the hall as well including Local 1183 of the United Steel Workers. The post-war era also saw Black Rock change and the Polish Cadets changed with it by allowing non-Polish membership. At the dawn of the twenty-first century the Polish Cadets had reached a balance of Polish traditions with modern reality. The Cadets were able to be true to their Polish roots by maintaining their Polish library, being the home of the Harmony Polish Folk Ensemble and hosting a popular Dyngus Day party while adapting to other cultures including a Bavarian Oktoberfest. In 2014, the Polish Cadets celebrated their 115th anniversary of preserving Polonia in Black Rock. 90th Anniversary 1899-1989 Polish Cadets of Buffalo, Inc. Tonawanda, NY: Fisher, 1989. Print. "Buffalo Joins Czecho-Slovakian Day Observance." Buffalo Courier-Express[Buffalo, NY] 30 Oct. 1939: 5. Print. "Danzig Cession by Poland to Hitler Doubted." Buffalo Courier-Express[Buffalo, NY] 8 May 1939: 11. Print. "Great Day for Polish People." Buffalo Morning Express [Buffalo, NY] 23 Oct. 1906: 3. Print. "Local to Mark Pact Anniversary." Buffalo Courier-Express [Buffalo, NY] Mar. 1957: 28. Print. "PNA Leader Defends Anti-Mikoyan Protest." Buffalo Courier-Express[Buffalo, NY] 12 Jan. 1959: 5. Print. "Polish Cadets." Buffalo Courier-Express [Buffalo, NY] 19 Oct. 1959: 14. Print. "Polish Cadets Elect." Buffalo Evening News [Buffalo, NY] 17 Dec. 1928: 32. Print. "Polish Cadets Lay Stone of New Building." Buffalo Evening News [Buffalo, NY] 9 Sept. 1913: 8. Print. "Polish Cadets Mark 60th Anniversary." Buffalo Courier-Express [Buffalo, NY] 19 Oct. 1959: 8. Print.